Earlier this week, we discussed the ongoing San Francisco housing crisis. Sadly, as too many of you know from personal experience, the housing issues in California go beyond one city. California mobile home residents, particularly those living in San Jose mobile homes, are also living in fear of losing their homes because of owners selling to luxury home developers. Our San Jose tenant’s lawyer is ready to protect the rights of residents throughout Northern California who are facing unjust or unlawful eviction. The San Jose Mercury News recently covered the fight between residents of the Winchester Ranch Mobile Home Community and the park’s owners. There are 150 residents, mostly seniors and largely people on fixed incomes, in the 16-acre West San Jose community. Most own their coaches but pay between $833 and $1,000 to rent their site. The homes are mobile in name only because the coaches are anchored to the ground and, if they could move, are unlikely to be accepted elsewhere because of their age. Owners of the park lands are negotiating with developers who want to buy the prime real estate and build projects that would likely include luxury condominiums catering to high-salary tech professionals. With 58 mobile-home parks containing 10,800 spaces, San Jose has the state’s largest concentration of such housing which tends to cater to seniors, the disabled, and the working poor. Notably, the average rent for a one-bedroom apartment in San Jose is $1,825, well above the rental cost at Winchester. There is broad concern that Winchester Ranch would kick-off a trend of converting mobile home parks into upscale multi-use developments, adding to the affordable housing crisis. The city would need to approve such changes in land use and is faced with the dueling interests of high-value developers and the need to protect a vulnerable population. As the article notes, San Jose has an ordinance that addresses mobile park conversions. The 1986 law is untested but attempts to allow owners to sell while providing fair compensation to tenants. It also allows owners the opportunity to purchase the lots themselves. Leslye Corsiglia, the director of San Jose’s housing department, says that the city is in a hard spot trying to respect private property rights “but the community also has to balance the need for lower-income housing opportunities.” Notably, while not mentioned in the article, there are similar rules at the state level that can be found online. The nature of their homes and the fact that they are often lower-income means that mobile home owners are a vulnerable population. For this reason, there are laws specifically aimed at ensuring developers and land owners treat park residents with respect. State and local protections mean developers must obtain government approval for the change in use, give notice of an intended conversion, give the park residents an opportunity to purchase the lot themselves, and provide relocation assistance payments. The latter, discussed in an information slideshow produced by the City, may also include mitigation payments to help tenants move their homes or find new housing options. 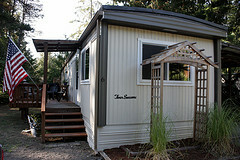 As a San Jose mobile home law firm, we work to ensure all of the legal requirements for conversion are met. We will also fight to maximize mitigation and relocation assistance payments. This includes making sure the payments take into consideration the tight market for affordable housing and the true market value of the lot. Call if we can help you and/or your neighbors.